If anyone has Classic Tv Toys Bobby Brady, that would go well with Joe Namath. The helmet is blank, maybe because they no longer have the rights using the Jets name? It looks pretty much like the old gumball machine helmets. Like you said earlier, it is a nod to the original. This is the original. 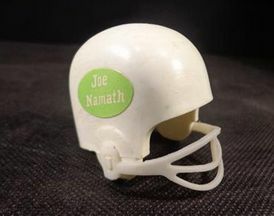 Namath rocked a Schutt cowcatcher facemask, which Mego almost got right, except missing one vertical bar on the facemask. 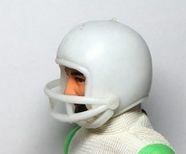 If New Mego wanted to, they could have gone with the original 2 bar Action Jackson Football Helmet design, which came with a chin strap and is even nicer than the NFL Action Team Mates. But they didn't want to. They didn't even want to fix the missing vertical bar from the original facemask because they wanted it to be an 8" version of the original; flaws and all. So back to what you were saying: It doesn't look very cheap nor terrible; it looks like what they wanted it to look like: an 8" version of a larger vintage figure. Looks good! 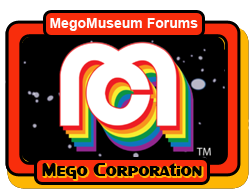 Reminds me of when I used to take my gumball football helmets, stick them on my Megos and other figures and play a game of football between them. Spidey was always the star player! I bet it would look great put onto a Type S body with all the poseable possibilities that comes with it. Like I said, it looks ridiculous, but it has a reason to. Doesn't change the fact that it looks cheap. The shoulder pads on the outside don't bother me. I doubt many of the factory workers in China know how they are suppose to go on. Yeah. The rose goes in the front. I have zero interest in sports but this figure is a must have for me! There is a picture on FB of him with the pads INSIDE the jersey and it looks great. Head sculpt is a spot-on likeness AND it's in scale. He'll look great next to my AJ sportsmen. Hope they make more! Last edited by monitor_ep; Jan 7, '19 at 8:39 PM. Hmmm, who could I cast him as on Batman '66? Sportsmaster seems too obvious. I'd like to know when he's going to become available for purchase.